Analog Artist Digital World: Stephanie and Arias on the Fringe Outdoor Stage. 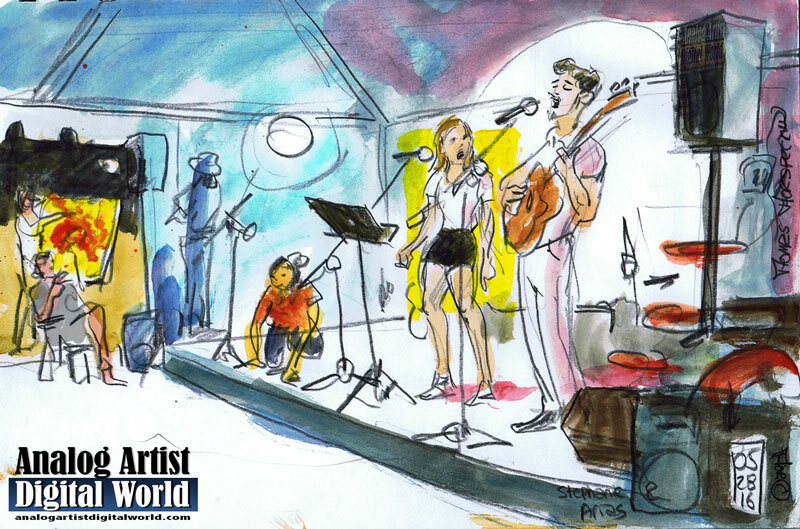 Stephanie and Arias performed on the outdoor stage at this year's Fringe Festival. They harmonize beautifully. I imagine they are a young couple very much in love. Their original music resonated with me. Love in my life however has become confusing with no solid bedrock. My past haunts me and forgiveness is something I will never be granted. The music was sweet and sincere but my heart was in a different place. I chased imagined ideals and ignore the reality of what is in front of me. Perhaps sketching is a distraction to keep me from facing who I am or what I have become. One friend forced me to face mistakes I have made. Were morals lost along the way? I am rootless, a tumbleweed. I realize now that grief must be faced alone. Grief can and probably should last for years. Perhaps turning to my sketching will help me find my roots again. I always claimed that writing these posts would help me put down roots in Orlando. I need to put down roots of devotion. I have no solid floor. Some tiles shift and fly up with no mortar. Others cling tightly refusing to let go. There is no sure footing. I lost trust in love, and then I thought I found joy and affection again by opening up to a friend. There was a level of intimacy in some of these conversations that I had never experienced before. I then discovered that this friend had no trust in me. Trust needs to be earned. This stung worse than the even larger losses I am going though right now. I am transparent and easily judged. Perhaps I need to turn to meditation. I have no clear, open, sane, relaxed point of view about how to live a fulfilling life. I have no home. Isn't sketching a form of meditation? It makes me fully present, and it drowns out the noise. This one simple action of doing one sketch a day is the one strength I fall back on. I need to find other sources of strength. I realize that I am lost... How did all this come from listening to this couple sing. They seem so happy. They seem to be living on love alone. Ideals get dashed. Time is short. On the tent wall behind the performers, Carl Knickerbocker, a local artist was projecting a short film memorializing the life of artist, Morgan Steele. I met Morgan at an Eco Action lake cleanup this past February. He was curious about my art and we talked for some time. He remained on shore with me as volunteers in canoes explored Lake Virginia cleaning up it's shores of garbage. I sketched him as he leaned up against a cross in the shade of a live oak. Shortly after that day, he lost control his car, which careened into some cement construction barricades as as he returned home from Stardust Video and Coffee. Some claimed that my sketch of Morgan prophesied his early death. Life is short and love fleeting. Art crumbles.